SEOUL -- South Korea and Spain will hold a joint committee meeting on defense industry cooperation this week, sparking speculation about a possible swap deal involving Europe's modern A400M transport aircraft and South Korea's home-made military trainers. The two-day meeting to be held in Madrid on Monday was a key topic at a defense ministry press briefing, but the Defense Acquisition Program Administration (DAPA), a state body in charge of procuring military equipment, gave a basic answer, citing a bilateral agreement on confidentiality. 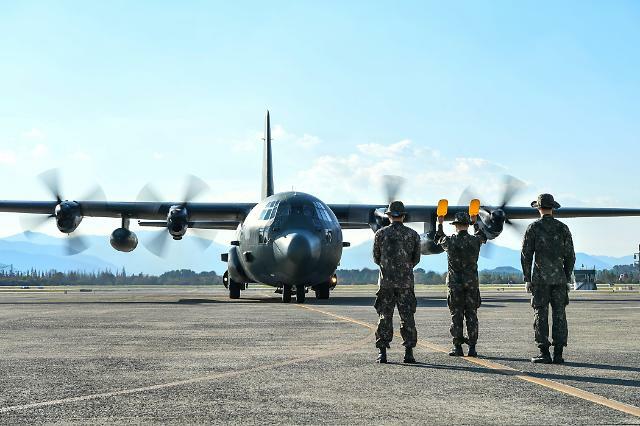 "It's not a negotiated agreement between the two governments," a DAPA spokesman told reporters, responding to a question whether the two countries would discuss the idea of swapping A400Ms with trainers produced by South Korea's sole aircraft maker, Korea Aerospace Industries (KAI). KAI produces KT-1 turboprop basic aircraft and T-50 supersonic trainer jets. DAPA officials refused to confirm news reports that Spain came up with a swap deal at an international air show in Britain in July, saying that the two countries would only discuss "logistics cooperation." The A400M Atlas, delivered first to France in August 2013, is a four-engine turboprop transport aircraft. It was designed as a tactical airlifter with strategic capabilities to replace older transport aircraft such as the Lockheed C-130 Hercules. Spain ordered 27 A400Ms and three have been delivered. The Lockheed C-130 Hercules is an American four-engine turboprop military transport aircraft. It is the longest continuously produced military aircraft at over 60 years. South Korea has a military program to introduce new military transport planes.